Eine Radtour quer durch Süddeutschland über 667 Kilometer. Die Tagesetappen betragen zwischen 105 und 156 Kilometer. Die Tour beginnt und endet in München. Durch das oberbayerische Voralpenland geht es nach Füssen. Nach der Fahrt durch das Allgäu erreichen wir den Bodensee. Mit dem Rheinfall bei Schaffhausen ist der westlichste Punkt der Rundfahrt erreicht. Nur 30 Kilometer weiter nördlich fließt die Donau, der wir ostwärts bis kurz vor Ulm folgen. Ab Laupheim geht es schnurstracks nach Osten bis München. Eine abwechslungsreiche Radtour durch das zentrale Südfrankreich über insgesamt 630 km, 7 Tagesetappen zwischen 64 und 120 Kilometer. Eine reizvolle Radtour in 7 Etappen über insgesamt 829 km durch hügeliges Gelände, Tagesetappen zwischen 90 und 145 km. Die Etappenziele wurden nach Sehenswürdigkeiten und dem Angebot der örtlichen Gastronomie ausgewählt. During the summer of 2006, I traveled with only a bicycle from Lviv, Ukraine down to Napoli, Italy, then north to Calais, France. From Calais I ferried to Dover, then rode to London to complete the voyage. I visited eleven countries and saw a variety of landscapes and weather. I had encounters with many people and most of these were positive. I also used this experience to draw attention to a little orphanage in eastern Ukraine, the Makiivka HIV / AIDS orphanage. Eine Radtour durch die französischen Pyrenäen in 8 Tagesetappen über 760 km. Das Gebirge, wo Majestix der Himmel auf den Kopf gefallen wäre. Die Wolkendecke hängt vor allem im westlichen Teil der Pyrenäen so tief, daß man Mühe hat die Straße zu sehen. Obwohl nicht so hoch wie die bekannten Alpenpässe, haben es die hiesigen ``Giftzwerge'' in sich. A bike circle within 8 stages over 760 km through the French Pyrenees. The mountain range where the sky would have been fallen on Majestix' head. Expecially in the western part of the Pyrenees, the cloud cover is so low that it is difficult to see the road. Although not as high as the well known passes in the Alpes, the local ``spiteful little devils'' are tough ones. A weeklong trip through Germany from Frankfurt Airport to Munich via the Romantic Road, and Dachau. We're Andrew & Friedel Grant - two Canadians who, after living in the UK for 6 years, have set off to travel the world by bicycle. We had no previous bike touring experience when we began, having really only gotten into cycling at the start of 2006, and when we say we ``got into cycling'' that means short commutes to work along flat cycle paths and the odd day trip, that usually ended up at the pub. We're still not quite certain how that translated into the situation where Friedel said ``hey, let's bike around the world'' and Andrew said ``sure, why not''. The first leg of our tour was in Canada, then through Europe to Morocco. We will keep cycling around the world; hopefully next towards eastern Europe and the Middle East. In the summers of 2004 and 2005 we cycled the Turkish Black Sea coast all the way from Istanbul to the Georgian border. On my webspace you'll find a description of the route and the pictures of the trip from 2005 to tell the story. Enjoy! Having sold all our belongings; paid all our debts; having said goodbye to all our friends, we will be looking forward to a five year cycling adventure. It will take us around the world and through five continents. During our travels we'll keep you up-to-date via this site with travel stories via our diary; photos in our slide show; and we will even try to put some film in as well. This trip had riders and non riders alike. This might be the most beautiful experience in Canada that any American can have. Even the cabin in the woods (which outside of no electricity and running water, was phenomenal - see pics from day 3) was impressive. Non riders could hike in and out to this location, or spend 2 nights in Elkford. Only the motel in Elkford was modest - even though it also had high speed internet. The remaining accommodations would all be rated 3 or 4 stars, yet were very modestly priced. While food selections were limited in some locations, the food was outstanding in others. All in all, I would not be afraid to take even the most seasoned traveler on this trip. There is a button that details each day of our trip. Lots of pictures, my diary of what happened each day, and I've posted both the original itinerary as well as the packing list (which turned out to be just right). The map we used was from the Adventure Cycling Association, and it was right on! It only lacked good information about climbing. I've added that myself as I uploaded it from my GPS. Six men set out on a journey that would build character in body, mind and spirit. Physical challenges, scenery and surroundings ``to die for'', and a spiritual emphasis made this trip truly ``one of a kind''. There are many photos, detailed route maps, a list of everything we packed, the expenses for the trip and a daily ``blog'' or diary of each day. If your planning on doing this trip, it probably is worth your reading. If you've never done a multi-day trip in the ``back country'', it's a ``must read''. It was a trip none of us will ever forget - in the best sort of way! Enjoy! Another tour of the mighty Alps, which lasted 25 days. I cycled only 3615 km this time (around the same distance as the Tour de France) and climbed merely 150 different passes (some more than once) of which 103 were new to me. It added up to 79544m height metres. Maratona-rides: Gran Fondo Marco Pantani & Maratona dles Dolomites. Places: Aprica, Vivione, San Marco, Garda, Monte Pasubio, Asiago, Misurina, Vallarga, Cuneo, Casterino, Mont Authion, Molini di Triora, Sampeyre, Sestriere, Mont Cenis, l'Iseran, Aréches, Chamonix, Lac d'Emosson, Bretaye, Hahnenmoos, Gemmi, Grosse Scheidegg, Glaspass. A trip planned in 2007 to cycle across Eurasia. Follow along as Mike discovers Russia by bicycle. Departure from Amsterdam at end of March. Plan is to ride the first month to St Petersburg and then for five months cycling across Russia including the new section of road across Siberia. This was a credit card tour (stayed in hotels and ate at restaurants). The route was from Como, Italy to Trento and Cortino de Ampezzo, then into Austria and over the GrossGlockner. Return was via Innsbruck and St. Moritz to Como. A mental and cycling experience in a not cycling friendly country. This is my one day 399km trip from Bucharest to the Black Sea. As a meditation to the cycling experience in a country where cyclists are ridiculised daily. Summer 2006 we cycled Eastern Europe. We started in Bucharest Romania and went all the way to the Ukraine border into Hungary, Slovakia, Chzechoslovakia into Germany. On my windows webspace the route and the pictures tell the story. Enjoy! I started my cycling holidays in Maroc. After traveling a great part of the world and to Maroc two times by bus and one time by hired car. I hoped there was something better to do it, and there was....the bicycle. Since then the cycling-bug got me and I visited more countries on a bicycle. 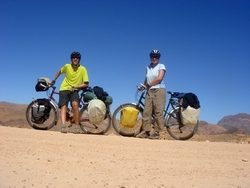 On my windows webspace the route and the pictures tell the story of a few bicycletrips in Maroc. Enjoy! This time we cycle from our front door in Munich, our goal is my sister's house in southern France, near Toulouse. We ride to Lake Constance and on through Switzerland, then in France we follow the Valley of the Rhone to the Mediterranean. 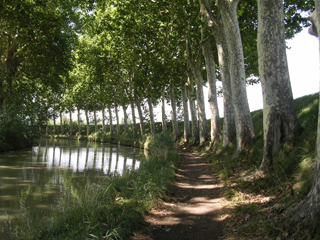 From here we can ride on parts of the Canal du Midi to where my sister spends her summers in the little town of Durfort. After our visit we have enough time to continue on to the Atlantic. We started out as so-called credit-card cyclists and ended up buying a tent along the way and camping whenever we got the chance. On the road, we stopped at a fruit and vegetable stand owned by Maoris natives, the first peoples to inhabit New Zealand. They gave us a warm welcome and soon the whole family, aunts, uncles, and children, was buzzing around us. They showed us their craft centre and took some pictures. Thinking we were missing something, they made us a Baby on Board sign. We fastened the sign to Marjolaine's bike, over-thanked our hosts, and were back on the road an hour and a half later with 3 tomatoes, 1 avocado, and 10 kiwis. We are a couple from London who are taking a year out, from 1st March 2006 to complete our adventure of a lifetime. We plan to cycle from Cancun in Mexico through Central America, then from Equador to Patagonia at the tip of South America. In doing this, we are hoping to raise money for our two favourite charities; Medecins Sans Frontieres is an humanitarian medical agency providing medical aid wherever needed. The Psychiatry Research Trust raises funds for research into mental illness and brain disease. A travelogue from an 8 month, 16,000km bike tour from London to Beijing via the ancient silk roads. A 40,000 km. 3 year ride through 30 countries, from far eastern Russia (Siberia) in winter, to London England, via Australia. Trying to cover the whole route by bicycle and boat only. I have encountered plenty of good times and a few tough ones, noteably in Siberia (camping at minus forty), Papua New Guinea (pushing my bike down a beach as no roads) and Tibet (in winter). We had just finished cycling the South Island of New Zealand and instead of sitting back and relaxing on the flight home, we began planning our next trip, a month long self-supported cycling trip in France. What better place to begin a trip to France then in Paris. From the 'City of Lights' we would dabble in a little art history by visiting Monet's gardens and then it would be off to the D-day beaches and a WWII history lesson. From 20th century history we would go back in time to the 11th century and visit Bayeaux and its famous tapestry. We would then check out life in a monastery, cycling across Normandy to Mt. St. Michel. From Mt. St. Michel we would travel along the Brittany coast. At St. Malo we would leave the coast for the medieval city of Dinan and continue to the mouth of the Loire. We would then cycle through the land of chateaux and wineries ending our trip at Fontainebleau. Our site includes lots of photos along with a daily log and an equipment list. In the summer of 2006 I aimed to finish to succeed the Granfondo Campagnolo, the hardest bicyclemarathon in Italy in 2006. Before the Granfondo I and two friends of mine spent 3 days in the Dolomites, with those tours I bicycled onto 6 passes above 2000m there. The most wondeful climb was the very hard Tre Cime di Lavaredo (2350 m) from the Lake Misurina, with a beautiful panorama. An another memorable pass was the Staller Sattel (2052 m) on the austrian border: the last 5 km is very nice with panorama, calmness, forest, flowers, blue lake down and snow on the mountains. 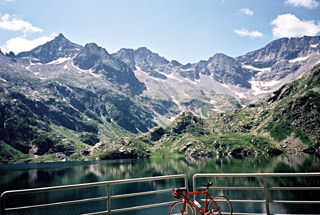 The Giau pass was a hard one, but ``only averagely nice''. The Granfondo was one of my most memorable bicycle memory. I was the only one who finished it with a 13 kg+ 2,5 kg pack heavy touring bike. I could bicycle with the last 30-40 participant; I enjoyed the nature, countryside and the feeling; I stopped few times for photos. After arriving in time, as the speaker saw with how a bike I arrived into the finish, he called me next to him and after 2-3 sentences he spoke a few minutes about my performance. After it, the 50 people audience clapped for me and immediatelly I could hear the hungarian anthem from the loud-speakers. It was a surprise for me from the speaker, who found this performance very serious with a bike, I had. After the last 2 years of my alpine bicycletours, in 2006 I went back to the Alps with the aim that after my tour maybe I would be the first hungarian people who bicycled up to all (74-75) of the asphalted alpine passes above 2000m. After 6 years of alone bicycling, this year I had two guys with me. In Italy and France we had nice, warm, sunny days with cycling a few hard cols, passes, like the 2612m high Passo Nivolet (I'm sure between the 3 best / most beautiful passes, where I had been), or the almost unknown Passo del Preit (2083 m), onto we bicycled in stormy weather with thunderstorms. The Fort Gondran (2347 m)was also very nice next to Briancon, I can suggest to visit it. After Col du Lautaret, Alpe d'Huez, Col du Sabot, we arrived to Chamonix on a nice day, when at last we could see the snowfields of the Mont Blanc before sunset. Next day we got rain and cold as we cycled to Switzerland, and the bad weather remained for 3-4 days long. We had to postpone passes onto the next days, or climbed 1-2 of them partly in rain and arrived to the top in 4-8 degrees Celsius. The Sustenpass was the worst and coldest. The Passo Spluga (2117 m) was also a very beautiful pass, with a lot of hairpins, views and superb hairpin-row on a almost vertical wall, with short straight sections. Because the times went by too fast on that evening I decided to climb the famous Mortirolo (and the 2100m high Passo Val Bighera) in dark, in the night. It was wonderful: in a calm, dark forst in a warm air. I enjoyed very much the nature, air, and the views, because it was light, because I had fortune with the full Moon. I enjoyed the feeling so much, that I spent much time above. Our last pass was the Passo Goletto di Crocette (2070 m), onto we had 8-10% steep kilometers in or after raining for 2-3 hours. With a few passes postponed, we remained 4 passes to climb, that I did in September 2006. Montenegro is beautiful. Montenegro is affordable. The personal train transport is also good in Montenegro (and you can carry bicycle). There are brilliant beaches, marvellous mountains and canyons, lovely lakes, old or cheer towns, a lot of cafes and restaruants with local specialities. So there are everything what we want. Even though we met only tree Russian bikers in this country. 12 countries, 12,000 kilometers, five men and five bikes. This is the story of a remarkable bicycle journey across Asia nearly entirely by bicycle. At the time, we believed it to be geographically and politically, the most diverse summer ride the planet had to offer. The website contains hundreds of high resolution photographs, extensive journals of each country and much advice on gear, immunizations, maps, routes and visas. 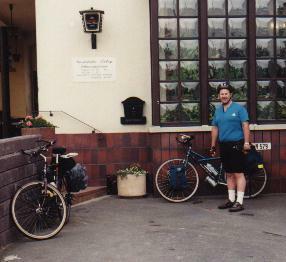 In the summer of 2006 we cycled 62 days and 3700 kilometers through Europe. From Holland to Germany, the Alps, Italy, Corfu, Lefkada, Keffalonia, Greece and western Turkey to complete our journey in front of Istanbul's Blue Mosque. On our site you can find a lot of pictures, tips and travel stories (in Dutch, English will appear later). In de zomer van 2006 fietsten we 3700 kilometer in 62 dagen door Europa. Van Nederland trokken we door Duitsland, de Alpen en Italië naar de Griekse eilanden Corfu, Lefkas en Keffalonia, over het Griekse vasteland naar Turkije om te eindigen voor de Blauwe Moskee in Istanbul. Veel plezier! This journey I made in Sept.2005. From Bremgarten (AG) cycling in direction Graubünden,the eastern part of Switserland. I enjoyed one week cycling, climbing 7 passes. From Bergen to Bodø by Bicycle. The cycle tour in 2006 we decided to make within Norway. We had in fact never been to the coastal areas between Trondheim and Bodø before. A lot has been done to promote cycling along this coast line, and the choice was not too difficult to make. The coast of Helgeland, as this area is called, is not as well known as Lofoten, that lies farther to the north, but we had already cycled in Lofoten, so this time we went for Helgeland. Why upstream the Elbe? Mostly, 80% to 90% there is west wind in Holland and North-Germany. Unfortunately the first few days it was the opposite. But of the 14 days only 2 were spoiled by rain, otherwise beautiful and in the beginning cloudless weather. At the same time there was a dreadful storm with flooding which caused enormous damage in the alpine area. This was our first go at cycling in Asia. Our route along the Mekong and to Sukhothai was an excellent choice for a short bike trip in Thailand - villages, beautiful scenery, good roads and little traffic. We loved it. 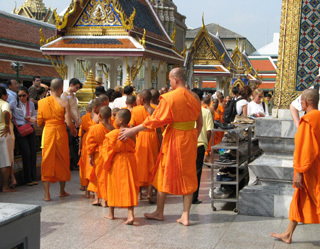 We also spent some time in Bangkok, Chiang Mai and Ayuthaya. Each leg of the trip is about 600 km long and will take me about a week (at a stately pace). I'll try to send an email from each city. I'm hoping to take a train back to Istanbul and spend my last week checking out the sights there. THE REALITY: Spent the bulk of the trip in Turkey, due to its inhabitants' incredible generosity and friendliness, as well as the dismal roads and driving in the Balkans. I enjoyed a marvellous bike trip from Alicante (South Spain) back to Switzerland. Three high points I wanted to visit. First; the country of ``Don Quijote'' in Castilla y Mancha. Second; ``El Escorial'' west of Madrid. Third; ``the bridge over the river Tarn'' in South France, build of the English star architect Norman Forster. I avoided busy roads as much as possible and enjoyed the quiet side streets, especial along the Pyrenees. The month August 2006 was one of the worst fore many years. Cold weather and much rain left little hope for a third bicycle tour this year. The weather forecasts of the first weekend in September promised however improvement. Sunday evening I packed my bags and Monday morning 10.15 a.m. I started cycling From Andermatt to Chur with a dertour. Vom 20 Juli bis 08 August 2006 fuhren wir den Rhein entlang von der Quelle (Tomasee) bis zur Mündung in Katwijk aan zee. Dort trägt sie noch den Nahme ``Rijn'', im Gegensatz zu Hoek van Holland.